The important games are coming thick and fast for Ballymena United Youth Academy’s under 13 National league side. With promotion guaranteed, the chase for cup silverware unfortunately came to a close on Saturday with a narrow defeat to Cliftonville in the NIBFA plate semis. The under 14’s faced runaway league leaders Portadown at the 3g on Friday evening and a three goal defeat was tough on United who performed well for long periods. The under 15’s continue to impress on the road, yet another away win in Londonderry,this time over a highly rated Maiden City side, this has to rank as one of United’s best performances of the season. The under 12’s faced Loughgall after a successful Larne Sevens on Monday, while the 11’s lost out on junior “derby day” in a close game in Coleraine. There was also another high scoring salvo from the senior under 16s, scoring six on their travels against Sion. Coleraine 3, BUYA 1: Despite early pressure it was Coleraine who took the lead, which they held onto half time. Ballymena kept at it in the second period but went behind to an excellent goal and finish after the break. Lewis Tennant got a goal back with 10 mins remaining and despite several efforts, they were unable to equalise. Coleraine scored a late breakaway goal to finish the game. MOM - William Francey. BUYA v Loughgall: United were missing a number of personnel on the day and some defensive frailties early on were to cost them against a highly talented side. Against the gale, the Skies struggled against the pace of their opponents and also had a penalty well saved. They made a game of it in the second period, Kyle Neill once again getting on the scoresheet with a smart finish. Loughgall finished the stronger side but United did play some excellent passing football at times and can be proud of how far they have come on this season. At Easter Monday’s Larne Sevens the United under 12 side finished third from twelve sides with some high quality football played on the day in glorious weather. Cliftonville 4, BUYA 3: It was Cliftonville who took the lead when finishing from close range from a corner. The sky blues drew level when Lewis Mearns drilled home from a corner also. The Reds regained the lead before Bobby Rainey finished well from outside the box. Just before half time Cliftonville made it 3-2. Lewis Mearns levelled the match and both sides had chances to win it before Cliftonville scrambled home the winning goal. BUYA 0, Portadown 3: Ballymena were very comfortable in the first half and created a number of chances however Portadown scored a soft goal to take the lead. Into the second half and the game changing decision after 20 minutes, with a highly debatable call, the ball from a Ports shot did not appear to have crossed the line but the goal was awarded, leaving United shellshocked. The high quality overhead kick from the Ports striker came with less than 3 minutes left and on the back of a number of great saves by keeper Ben Fry who was outstanding on the night. Maiden City 0, BUYA 1: Maiden City had two of their international players for this fixture but it was the Sky Blues who were the stand out team here especially in the second period where they should have added to another Joshua Galloway special effort which looped over the Maiden keeper. This game was won in the midfield with a terrier like display from Adam Neilly and Andrew Smyth which created a platform for the players further forward. As a lone striker Stephen McColgan put in a tireless display with able support from Jack Millar who thrived on his role behind the front man. 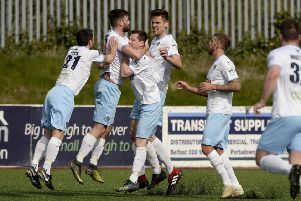 Sion Swifts 1, Ballymena United 6: Luke Stockman opened the scoring with a well taken shot from the edge of the box and Bailey McNeill made it 2-0 when he reacted quickest to a lose ball and fired home from outside the box. Sam Armstrong when it 3-0 after good work from Jack Walshe. Just before half time Michael McCabe made it 4-0 when he fired home from an acute angle.Ballymena continued to dominate possesion in the second half and quickly made it 5-0 when Jack Walshe scored at the second attempt after the keeper saved his initial shot. Sion pulled a goal back but Michael McCabe scored his second of the game to make the final score 6-1.